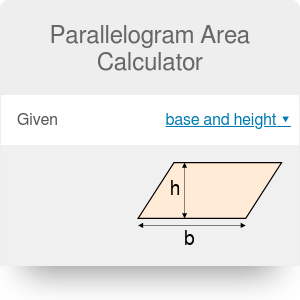 If you have any problems with the geometry of a parallelogram, check this parallelogram area calculator (and also its twin brother, parallelogram perimeter calculator). Whether you want to calculate the area given base and height, sides and angle or diagonals of a parallelogram and angle between them, you are in the right place. Don't ask how to find the area of a parallelogram, just give the calculator a try! Below you can find out how the tool is working - the parallelogram area formulas and neat explanation are all you need to understand the topic. A parallelogram is a simple quadrilateral with two pairs of parallel sides. Every rectangle is a parallelogram as well as every rhombus and square. Remember, it's not working the other way round! Which formulas does the parallelogram area calculator use? Did you notice something? The formula for the area of a parallelogram is pretty much the same as for rectangle area! Why is it so? Have a look at the picture: a parallelogram can be divided into a trapezoid and a right triangle and rearranged to the rectangle. Does it ring a bell? This formula comes from trigonometry, and is used for example in triangle area - the parallelogram may be seen as two congruent triangles. The adjacent angles in the parallelogram are supplementary, so you can choose whichever angle you want because sin(angle) = sin(180° - angle). The formula comes from trigonometry as well. Do you want to know where it comes from? Divide the parallelogram into two triangles, assume that our e diagonal is the "base" for both new triangles. What's the height of that triangle? Use the sine function. It's (f/2) * sin(angle)! The area of the triangle is equal to our "base" e times height: e * (f/2) * sin(angle) The parallelogram consists of two such triangles, so the area equals e * f * sin(angle). Have a look at your exercise. What is given, what is unknown? Choose the right calculator part for your needs. Assume that we want to calculate the area knowing the diagonals of a parallelogram and the angle between diagonals. Enter the given values to the right boxes. Assume 5 in, 13 in and 30° for the first diagonal, second one and the angle between them, respectively. The calculator displays the area of a parallelogram value. It's 32.5 in² in our case. Check out our area calculators for other shapes, such as rhombus, circle and trapezoid area calculator. Parallelogram Area Calculator can be embedded on your website to enrich the content you wrote and make it easier for your visitors to understand your message.